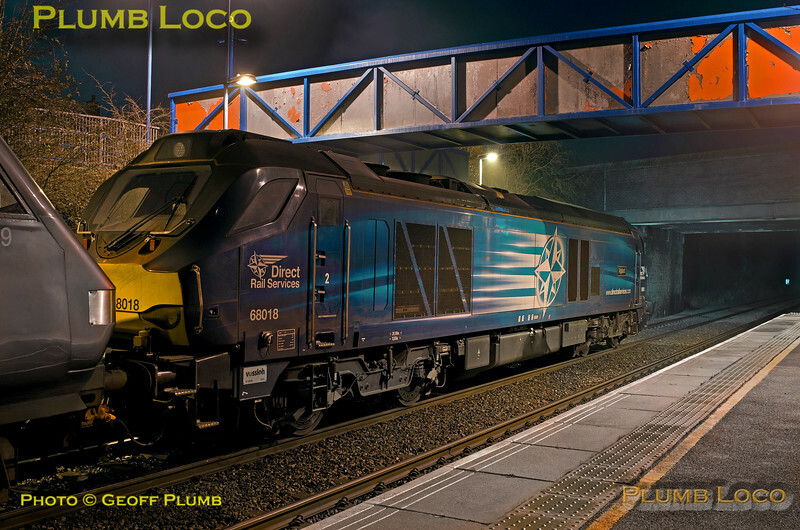 Due to problems with Class 68 suspension/springing the availability of the locos has suffered and Chiltern have had to hire in locos from DRS. As these are not compatible with DVTs the locos are working Top & Tail on the "slam door" set AL05 for the time being. 68018 "Vigilant" leads the set ahead of DVT 82309 and 68002 "Intrepid" brings up the rear of 1H06, the 06:23 from Bicester North to Marylebone as it pauses at Haddenham & Thame Parkway station at 06:36 on Friday 10th February 2017, the first up working in this mode. Digital Image No. IGMP23117.